Had an arrow in his back not felled the legendary Iceman some 5,300 years ago, he would have likely dropped dead from a heart attack. Written in the DNA of his remains was a propensity for cardiovascular disease. Evolution has improved upon the genetic foundations of human health for millennia, a new study says. Heart problems were much more common in the genes of our ancient ancestors than in ours today, according to a new study by the Georgia Institute of Technology, which computationally compared genetic disease factors in modern humans with those of people through the millennia. Overall, the news from the study is good. Evolution appears, through the ages, to have weeded out genetic influences that promote disease, while promulgating influences that protect from disease. But for us modern folks, there's also a hint of bad news. That generally healthy trend might have reversed in the last 500 to 1,000 years, meaning that, with the exception of cardiovascular ailments, disease risks found in our genes may be on the rise. For mental health, our genetic underpinnings looked especially worse than those of our ancient forebears. Though the long-term positive trend looks very clear in the data, it's too early to tell if the initial impression of a shorter-term reversal will hold. Further research in this brand new field could dismiss it. "That could well happen," said principal investigator Joe Lachance, an assistant professor in Georgia Tech's School of Biological Sciences. "But it was still perplexing to see a good many of our ancestors' genomes looking considerably healthier than ours do. That wasn't really expected." Lachance, former postdoctoral assistant Ali Berens, and undergraduate student Taylor Cooper published their results in the journal Human Biology. They hope that by better understanding our evolutionary history, researchers will someday be able to project future human populations' genomic health forward, as well as perhaps their medical needs. Despite what may be a striking, recent negative trend, through the millennia genetic risks to health clearly appear to have diminished, according to the study's main finding. "That was to be expected because larger populations are better able to purge disease-causing genetic variants," Lachance said. The researchers scoured DNA records covering thousands of years of human remains along with those of our distant evolutionary cousins, such as Neanderthals, for genetic locations, or "loci," associated with common diseases. "We looked at heart disease, digestive problems, dental health, muscle disorders, psychiatric issues, and some other traits," Cooper said. After determining that they could computationally compare 3,180 disease loci common to ancients and modern humans, the researchers checked for genetic variants, or "alleles," associated with the likelihood of those diseases, or associated with the protection from them. Nine millennia ago and before that, the genetic underpinnings of the diseases looked dismal. "Humans way back then, and Neanderthals and Denisovans -- they're our distant evolutionary cousins -- they appear to have had a lot more alleles that promoted disease than we do," Lachance said. "The genetic risks for cardiovascular disease were particularly troubling in the past." As millennia marched on, overall genetic health foundations got much better, the study's results showed. The frequency of alleles that promote disease dropped while protective alleles rose at a steady clip. Then again, there's that nagging initial impression in the study's data that, for a few centuries now, things may have gone off track. "Our genetic risk was on a downward trend, but in the last 500 or 1,000 years, our lifestyles and environments changed," Lachance said. This is speculation, but perhaps better food, shelter, clothing, and medicine have made humans less susceptible to disease alleles, so having them in our DNA is no longer as likely to kill us before we reproduce and pass them on. Also, the betterment over millennia in genetic health underpinnings seen in the analysis of select genes from 147 ancestors stands out so clearly that the researchers have had to wonder if the reversal in pattern in recent centuries, which seems so inconsistent with that long-term trend, is not perhaps a coincidence in the initial data set. The scientists would like to analyze more data sets to feel more confident about the apparent reversal. "We'd like to see more studies done on samples taken from humans who lived from 400 years ago to now," Cooper said. They would also like to do more research on the positioning of the genetic health of ancients relative to modern humans. "We may be overestimating the genetic health of previous hominins (humans and evolutionary cousins including Neanderthals)," Lachance said, "and we may need to shift estimates of hereditary disease risks for them over, which would mean they all had a lot worse health than we currently think." Until then, the researchers are taking the apparent slump in the genetic bedrock of health in recent centuries with a grain of salt. But that does not change the main observation. "The trend shows clear long-term reduction over millennia in ancient genetic health risks," said Berens, a former postdoctoral assistant. Viewed in graphs, the improvement is eye-popping. If the initial finding on the reversal does eventually hold up, it will mean that people who lived in the window of time from 2,000 to 6,000 years ago appear to have had, on the whole, DNA less prone to promoting disease than we do today, particularly for mental health. We moderns racked up much worse genetic likelihoods for depression, bipolar disorder, and schizophrenia. "We did look genetically better on average for cardiovascular and dental health," Lachance said. "But at every time interval we examined, ancient individuals looked healthier for psychiatric disorders, and we looked worse." Add to that a higher potential for migraine headaches. 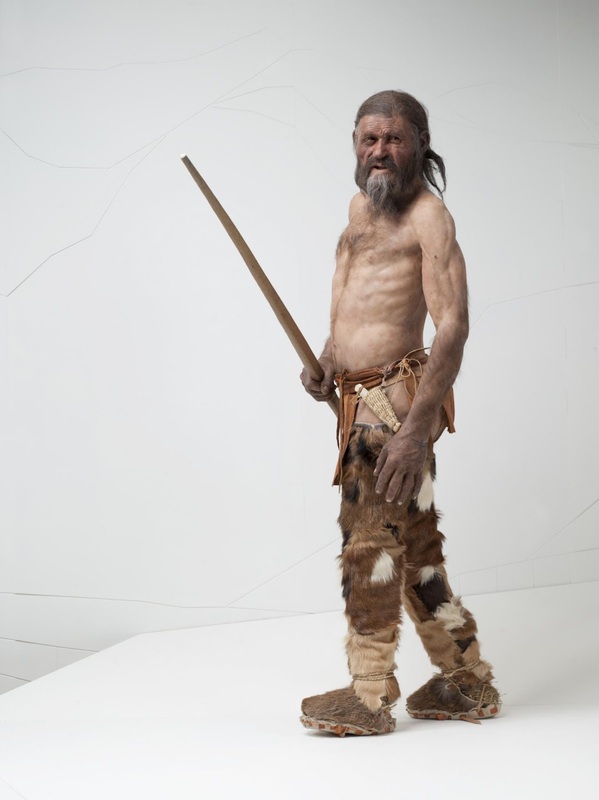 Drilling down in the data leads to individual genetic health profiles of famous ancients like the Altai Neanderthal, the Denisovan, and "Ötzi" the Iceman. Ötzi, like us, was Homo sapiens. Along with his dicey heart, the Iceman probably contended with lactose intolerance and allergies. Their propensity was also written in his DNA, but so was a likelihood for strapping muscles and enviable levelheadedness, making him a potentially formidable hunter or warrior. With his bow, recovered near his cadaver on a high mountain pass, Ötzi could have easily slain prey or foe at 100 paces. But the bow was unfinished and unstrung one fateful day around 3,300 B.C., leaving the Iceman with little defense against the enemy archer who punctured an artery near his left shoulder blade. The Iceman probably bled to death within minutes. Eventually, snow entombed him, and he lay frozen in the ice until a summer glacier melt in 1991 re-exposed him to view. Two German hikers came upon his mummified corpse that September on a ridge above Austria's Ötztal valley, which gave the popular press fodder to nickname him "Ötzi." 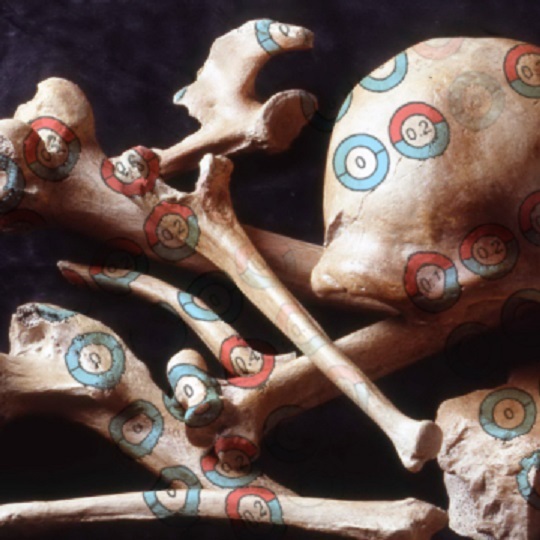 The near ideal condition of his remains, including genetic ones, has proven a treasure trove for ascientific study. But Ötzi is an extraordinary exception. Usually, flesh-bare, dry bones or fragments are all that is left of ancient hominins or even just people who died a century ago. "Ancient DNA samples may not contain complete genomic information, and that can limit comparison possibilities, so we have to rely on mathematical models to account for the gaps," Berens said. Collecting and analyzing more DNA samples from ancients will require vigorous effort by researchers across disciplines. But added data will give scientists a better idea of where the genetic underpinnings of human health came from, and where they're headed for our great grandchildren. * "Caveman" is a misnomer that stems from human remains and other artifacts being found in caves because they have been better preserved there through the centuries. Strong evidence points to early humans and our evolutionary cousins having lived mostly in open spaces.